You and tequila are pretty tight, but it's not like you hang out every day. That, of course, would put you in dangerous territory. You'd die of boredom. 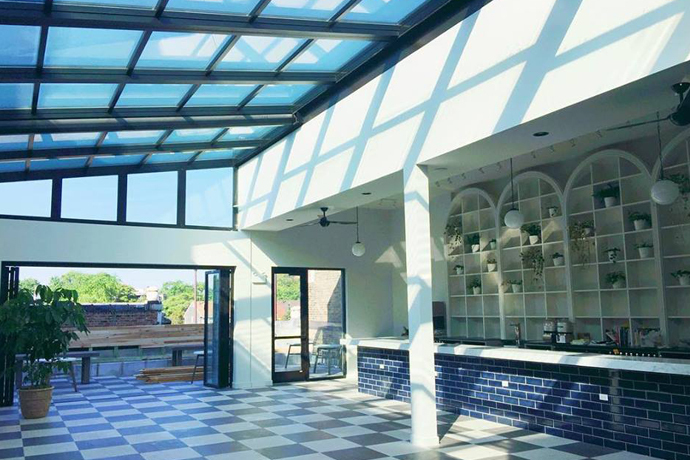 So let us introduce you to Fuego Mexican Grill & Margarita Bar, a new tequila adventureland now open in Logan Square. Carved from the same cloth as the Arlington Heights original, you'll appreciate Fuego's tendency to overachieve. When you enter the cavernous cantina—bedecked with murals of everyone from sultry Mexican actresses to its own jolly chef—you're going to get a pretty good idea of what's in store, culinary-wise: moles, tamales, enchiladas, fajitas, bushels of chips and plenty of salsa. But where Fuego really dominates is the tequila department. Grab a seat at the bar and admire shelf after shelf of one of the mightiest tequila collections we've ever seen—150 varieties of blancos, reposados and smoky añejos, ready to be taken down straight or sipped in one of a dozen exotic margaritas (passion fruit, honeydew, pomegranate), all blended on the spot with fresh fruit juice. And in mid-May, after a tequila bath and steak burrito, you can make your way upstairs to V-Live, a 1,500-person music venue from the Aragon Ballroom owner, bringing in the country's hottest hip-shaking Spanish acts. Just in case you wanted a bit of salsa with your tequila and salsa. And Fried Oreos and a Pool Table. Just Saying.